The flag of the City of Battle Creek, Michigan, consists of city logo on a white background. It can be seen on a photo here: www.battlecreekmich.com/prayerbreakfast/02/images/pb_14.jpg, located by Aleksandar Nemet. "Battle Creek is a city in the U.S. state of Michigan, in northwest Calhoun County, at the confluence of the Kalamazoo and Battle Creek Rivers. It is the principal city of the Battle Creek, Michigan Metropolitan Statistical Area, which encompasses all of Calhoun county. As of the 2000 census, the city had a total population of 53,364." - from Wikipedia: en.wikipedia.org/wiki/Battle_Creek,_Michigan. 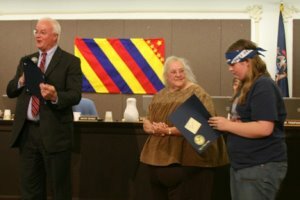 "Mary Butler of Heritage Battle Creek, and the young members of their youth group "Step Back in Time" and textile artist Kathy Berlincourt presented the City Commission with their reconstruction of a city flag that was commissioned in 1899 and subsequently lost."